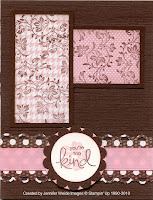 The card base is Chocolate Chip textured cardstock (click the photo to enlarge & see detail). I grabbed the Sweet Pea DSP stack again and choose a couple of Pretty In Pink and one Chocolate Chip print. The Chocolate Chip I used for the border layer behind the Pretty in Pink Satin ribbon. I punched it with the new Scallop Trim Border punch. The Pretty in Pink Prints I stamped with the Vintage Vogue stamp set vine image in Chocolate Chip. They are layered on Chocolate Chip cardstock for a tone on tone effect. The focal image was stamped on Whisper White, the small flower from Vintage Vogue in Pretty in Pink and "you're too kind" from Whimsical Words in Chocolate Chip. That was punched using the 1-3/8" circle punch and layered on a Scallop Circle punched from Chocolate Chip textured CS. That is layered on a Pretty in Pink 1-3/4" circle punch. Just barely shows, but it's enough for effect. Busy weekend on tap, but hope to be back soon!! Have a good one! !